IT is now a widely accepted fact that Technology is a key tool used in banking for a myriad of functions including customer service, information delivery, customer management, products processing, banking operations and management control. It is equally accepted that Nigeria has made significant advancement in the use of Technology. From having 152m mobile phone subscribers, to over 80m internet users (8th in the world) of which 70m are mobile internet users, and with over 32% of Bank customers accessing their accounts using technology-based virtual channels. Banks continue to make billions of Naira and Dollar investments in communication networks, data center, ATM, POS Systems and Digital Banking involving Social Media, Mobile Banking, Analytics, Cloud and Security. Banks also invest in building the technical skills of their staff, but sadly not enough time and investment is spent on building the skills of executive management and directors on the board. Yet, it is the board that provides overall direction including for the use of IT in the banks. This situation is not peculiar to Nigerian banks. A research report recently released by Accenture found a drastic lack of technology experience in the boardrooms of the world’s largest banks. 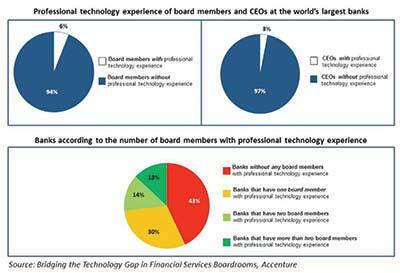 According to the report, “Bridging the Technology Gap in Financial Services Boardrooms,” only 6 percent of board members and 3 percent of CEOs at the world’s largest banks have professional technology experience. In addition, more than two-fifths (43 percent) of the banks have no board members – and nearly one-third (30 percent) have only one board member – with professional technology experience. The report – based on an analysis of the professional backgrounds of nearly 2,000 executive and non-executive board members at more than 100 of the largest banks in the world – defines “technology experience” as holding or having held senior technology positions at a company or senior responsibilities at a technology firm. Using this definition, the Nigerian situation is no different. A review of the 261 directors of the Top 20 banks in Nigeria revealed that only 2.3 percent of board members of our 20 Deposit Money banks have relevant professional technology experience. Yet many of the biggest challenges now confronting banking are intimately connected with technology, so directors need a robust understanding of technology if they are to make informed decisions. FinTech, Payments, KYC/Identity Management, Cyber-security, Risk Management, Business Continuity, IT resilience and technology implications of regulatory changes have all become critical board-level issues but many boards simply don’t have adequate expertise to assess these issues and make decisions about strategy, investment and how best to allocate technology resources. The boards of banks in the United States and the United Kingdom have higher percentages of directors with professional technology experience than those in any other countries, according to the report. But the numbers are still low, at 16 percent of directors in the US and 14 percent in the UK. Boards of Chinese, Brazilian, Greek, Italian and Russian banks have the lowest technological experience representation. Less than 1 percent of directors at Chinese banks – and none of the directors at Brazilian, Greek, Italian and Russian banks – have professional technology experience. Though, Nigeria banks at 2.3 percent of directors may seem to be in good company, the rapid advancements in Technology and mass adoption by citizens suggests that Nigerian banks need to quickly close the technology knowledge gap in the board room. Many banks now realise how important it is to close the technology gap and are looking to hire technology experts/advisors on the board but it is not easy and there are not too many of such experts who are also sufficiently independent. It is also important to recognise that simply having one or two technology experts on the board is not a panacea. Banks need to change boardroom culture through a combination of deep technology expertise and also much-improved understanding of the impact of technology among other board members. Some banks have explored Executive Briefing Sessions, Solution Showcases & Executive Visit and IT Tourism to Solution Centers and Technology Innovation Hubs as a means to bridging the technology gap in the boardroom and making directors more comfortable with Technology. The report recommends that banks set up board-level technology committees. Similar to Risk, Credit and Audit committees, Technology committees would provide additional expertise and advise the board on major technology decisions. At present only 11 percent of the top banks have technology committees. Most of the Nigerian banks have an IT Steering Committee/Technology Committee at the Management level, but not at the Board level. The report also suggests that financial services boards embark on regular programmes of personalized coaching to help improve the technology acumen of all directors so they are better equipped to make informed decisions. During these programmes, for instance, board members can be ‘reversed mentor’ by a young member of the Bank staff that is proficient in and comfortable with the use of technology (the digital natives, as youths of today are called). Baord members on such programmes could also work on scenario-based case studies to help them learn to make the right decisions around technology and investing challenges. It’s not sufficient for banks to just realize that their businesses are under threat and that innovation is critical to prevent them from being disrupted. They also need a clear innovation agenda with measurable objectives, investment plans and execution strategy. Technology is a major tool and enabler of innovation. New apps, virtual networks and cloud based tools are enabling innovation in payments, customer management, access to information, and also improving affordability, usability and accessibility of customers to banking services. Board members have a key role to play in helping set the trajectory for technology usage and monitor progress, but to do so, they will need to fill the current technology expertise gap in boardrooms.